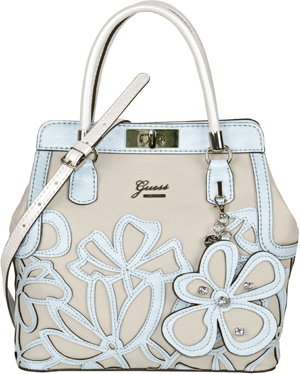 GUESS has launched its Spring 2013 bag collection & invited us to their showroom for a look! And all readers will enjoy a 10% discount on their Spring 2013 collection bags! Simply quote #GUESStote! Promotion ends 24th March! The kind staff at GUESS got us some treats to nibble on while we took a look at their latest collection! 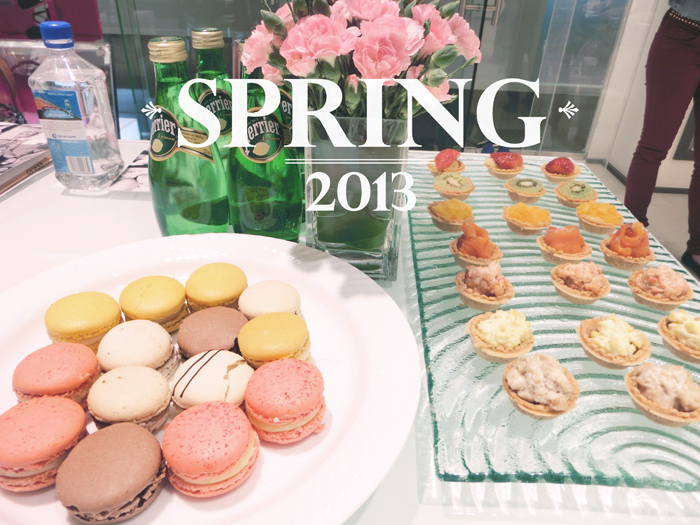 Their Spring collection features more colorful & fun designs for a playful & enthusiastic look this season! We'll both be styled in GUESS clothes & accessories for this feature so it's gonna be very exciting! 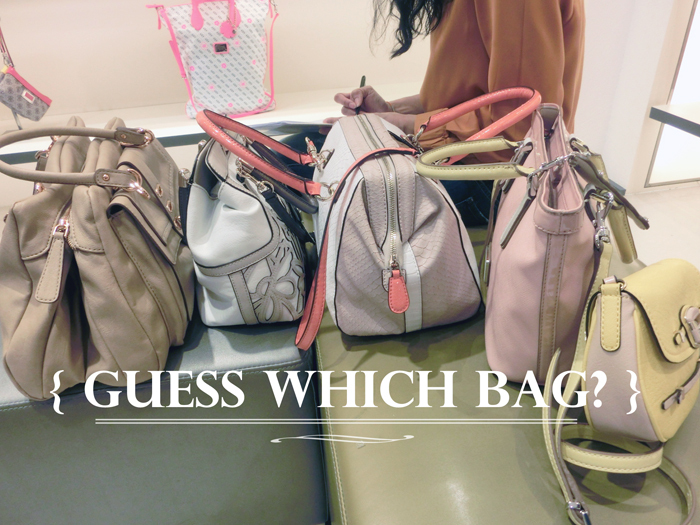 So now as you look through my pictures below you can mentally window-shop & pick out WHICH GUESS BAG YOU WOULD LIKE TO WIN ^_^ But of course I can only snap so many photos, so to see the full collection you can drop by any GUESS store to check out the bags! But nonetheless, here's a little preview! The Huma series, which comes in many different colours as you'll see later! Sweet & cute details from the Elara & Leandra lines! I think this Rumi bag was one of Qiuting's favorites! Shelves of Skya, Ivian & Madaket bags! All come in more various shapes & colours. More formal hues if you're not into bright colors! Slouchy bags that are ridiculously roomy! Playing around with some of the bags on display! Can you start to guess which were my favourites that day? And an irrelevant picture of me hahaha. That day we each individually picked out FIVE GUESS BAGS to show you guys! And ONE of the five bags is the one I get to keep! To win a GUESS bag of your choice, firstly you have to guess (haha) which one I kept! 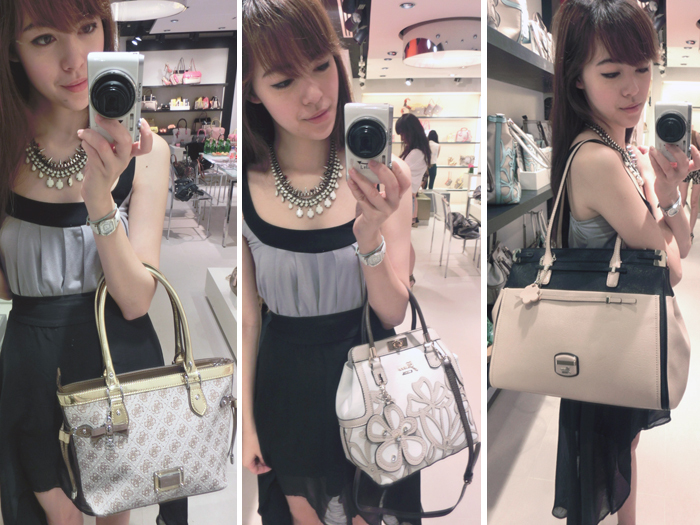 Here are the five bags I picked! I already see a rather consistent colour scheme here hahaha. So now the question is, which one did I decide to keep? It was a tough fight between two! If your taste is like mine maybe you'll pick the other one I wanted! You can put so much stuff inside it! I think this bag would be perfect for students or work! I also love the soft, slouchy shape! Worn with a casual outfit! This is something I would easily wear to university, swapping the denim shorts for a skirt if it's a more formal occasion. Easily goes with most outfits! 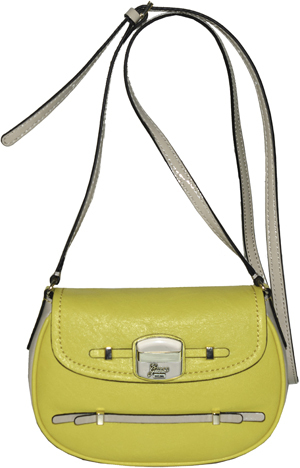 Here's a more playful design featuring a pop patent yellow with a structured pastel pink body! Comes with both long & short straps to be carried multiple ways! Here it is when it's carried as a sling! It's a very cute & fun bag with a good size to store all your essential items! A very, very cute mini handbag! I remember seeing that this came in many other colours like pink & black as well, but I love the eye-catching yellow of this piece! I love the colours of this one! 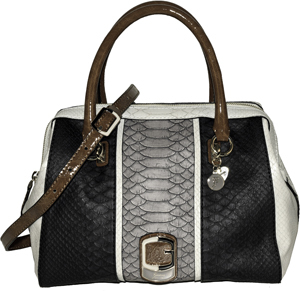 This bag has a very structure shape; sort of like the popular doctor bag. I think the salmon colour goes really well with the rest to make it colourful without being over-the-top! This is a good size for girls that want handbags they can still put a lot of stuff in! It's small enough without compromising on capacity. 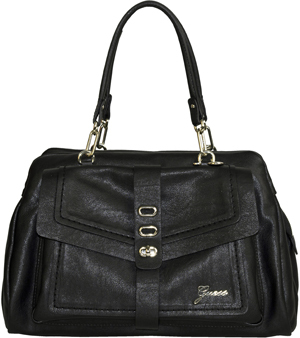 The satchel can be carried slung or hand-carried as well! I think all of them are pretty easy to match & all outfits are something I might wear! If you'd like to make a guess (haha again :x), here's how to join the contest! Create a collage/storyboard featuring the bag you think I picked, showing how you would match it! Here's two examples I made using Polyvore, but you can use Paint/Photoshop/phone apps/etc! Haha what do you guys think of my collages? It's up to you how you decide to mix & match it! Each bag is an individual, separate picture so it can be saved on its own :) Just right-click or drag! Upload your collage to Instagram, with the hashtags #GUESStote & #sophiewillocq! E.g. I think #sophiewillocq picked Bag (IV) in the #GUESStote contest & this is how I would style it! Remember to make sure your Instagram account is NOT locked! And yes you can submit multiple entries hahaha. So we'll all appear in a fashion magazine together styled in GUESS clothes & accessories! And we'll each get one GUESS bag! And don't forget about the ongoing promotion (until 24th March)! 20 comments on "GUESS Which Bag?" I like the first bag so muchhhhh! Are you a fan of Lady Gaga? Hi Sophie!! You made it throught to the final interview for SIA scheduled tomorrow right? May I know if you went through the kebaya rounds today?? is your dress from nastygal? :) what size did you get? An unrelated question to this Guess post, where in the world do u shop gurl! =o You have such pretty dresses, especially the floral dress and white dress in the last photo! that yellow mini handbag is sooo cute! I saw similar one in bongquiqui's blog but it was pink. I like the yellow one better though. I would really love to join but I'm not from singapore. :( I hope I can meet you someday pretty sophie! Anonymous: Of course it is not "Singapore citizens only" - anyone located in Singapore can try. I think that was pretty evident, most contests are unfortunately not open internationally! Where did you get the white dress in the last pic? Please share where you got the necklace you wore to Guess spring collection from. It's so badass looking yet classy! I like the Tisbury Box Satchel bag. I am thinking to complement the bag color to the dress I found on CaraMabes.